I was asked whether it was possible to stop messages showing as having been read as soon as you click on them. To do so, go to View – Reading Pane – Options. 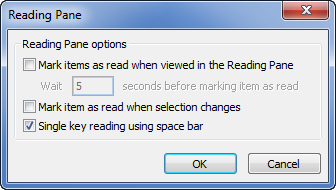 Remove the tick from the Mark items as read when viewed in the Reading Pane and also from the Mark item as read when selection changes check boxes. Click OK. Messages will then only be marked as read if you actually open the message. Find further details about Microsoft Outlook training Sydney, Australia or about Microsoft Outlook training London, Surrey, Middlesex or about Microsoft Outlook training Dorset, Hampshire, Wiltshire UK. This entry was posted in Microsoft Outlook 2010 and tagged Microsoft Outlook, not marking emails as read. Bookmark the permalink.